An aqua bike is like the first 2/3 of a triathlon: a swim followed by a transition to bicycle and then basically a bicycle time-trial. In this case, the swim and bike portions were the same as they are in a half-ironman triathlon: a swim of 1.2 miles (= 1900 meters) followed by 56 miles (= 90 kilometers) on the bike. Here's the race web page. The swim was in the Russian River where we swam half the distance upstream and then back down. The bicycling route was through the wine country in Sonoma county, California. I had done the full aqua bike a few years ago, so I knew the course very well. Here's the race report for that race. One of the big attractions this race had for me was that a large number of folks from my triathlon club (Silicon Valley Triathlon Club: SVTC) were going to be there, since not only were there two aqua-bike races, but also a full ironman-distance triathlon and a half-ironman for women only (called "Barb's Race"). 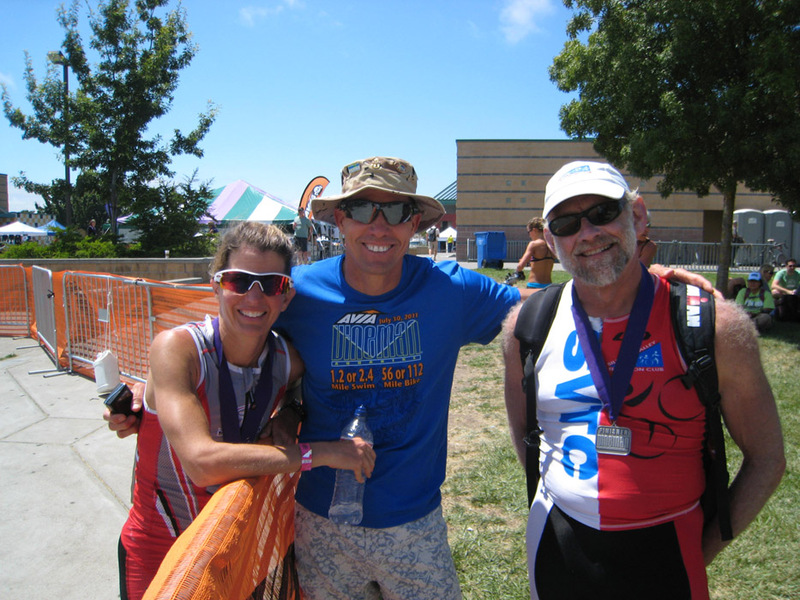 I like to race, but if it weren't for the social aspects, I'd probably not do triathlons. So having a large contingent of friends there makes this race extremely attractive. I am (probably "was" if you read this more than a month after I wrote it) getting ready for Ironman Canada in a few weeks so my coach suggested that I do just the half aqua bike this year instead of the full. He knew that once the race started, I wouldn't be able to hold back anything in spite of how stupid that would be for my Canada training. Besides, I liked the idea of a shorter race. I was planning to consider this race a "C" race, mostly for training, until I learned that it was the regional championship for aqua bike for the southwest region of the United States. As soon as I knew that, I was on the web, looking up times for all the folks who were in my age group (60-64 years old) to see if I could win, or at least be on the podium, for the championship. I couldn't find any data on some of them, but given the data I did find, it looked like I had a fair shot at winning and an almost certain podium slot. I didn't do any tapering for the race other than to take off the Friday before the Saturday which was race day. Normally in an open-water swim you just try to find somebody who's a bit faster than you and try to draft them, but Matt and I figured that if we started together we'd have a perfect draft for the entire swim portion, swapping the lead from time to time. We tried to practice it in the pool a few times the week before the race with terrible results, but were still confident that on race day amidst chaos and cloudy water that somehow things would work out. At the registration we ran into a third club member (Dale) who also swims at almost exactly our speed and so the three of us planned to start together and maybe swap the lead three ways. My wife Ellyn and I drove up the day before, had a good time talking to lots of SVTC peeps, I got registered, and then we drove to Guerneville to spend the night. The race venue makes things a little complicated: the race starts in Guerneville where we swim up and down the Russian River, then we transition to our bicycle and ride in a sort of open loop that winds up at the high school in the town of Windsor which is about 20 miles from Guerneville. For the aqua bike folks the race is then over, but the triathletes then transition to their running gear and run a half or full marathon (depending on the race they entered), ending at the high school. We registered at Windsor High School and the people doing the triathlons left their running gear in a transition area there. I think most people stayed near Windsor since there are a lot of fair-sized cities nearby and Guerneville is pretty tiny. But that meant that on race morning there would be a lot of traffic on a narrow road into Guerneville. Since the races included everything from a full ironman-distance triathlon to my wimpy half-ironman aqua bike, the start times were pretty staggered. 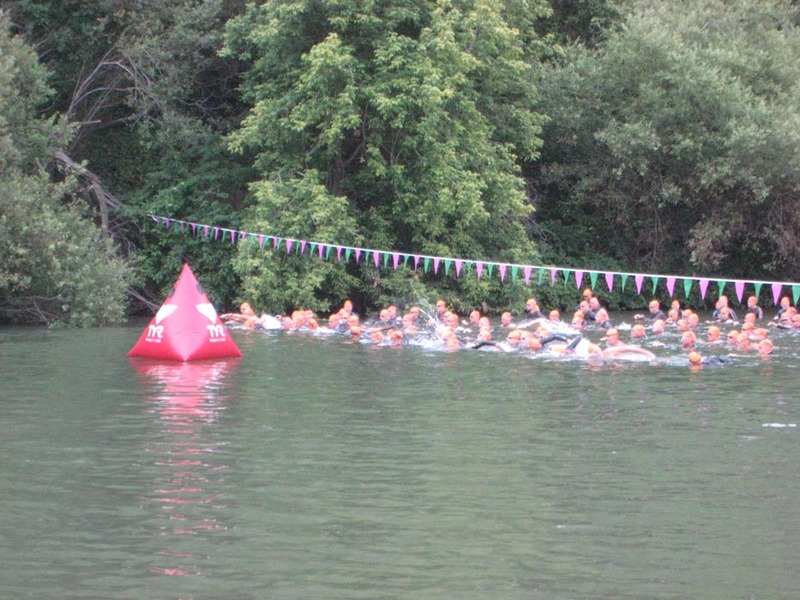 For the full Vineman triathlon, the waves started between 6:30 to 6:36. The full aqua bikers started between 6:42 to 6:45, and we in the half aqua bike and Barb's race started between 8:05 to 8:17. The idea is to pretty much to stagger all the 2.4 mile swimmers and to clear the river of almost all of those before we 1.2 mile swimmers start. The temperature was perfect: foggy and even a tiny bit of drizzle for the swim and start of the bike, and overcast and cool, at least through the end of my race. The previous time I did it I got so hot by the end of the bike leg that I started having severe cramping problems and had hydration problems as well. Ellyn's plan was to drive me to near the start and drop me off with my bike and other stuff. Then she'd find a place to park and walk to the start to watch us take off. With my late start, we left the motel (which was only a mile or so from the start) at 6:30, giving me more than an hour to get ready (and socialize, of course). That worked well, and luckily she parked not too far away, since I managed to leave my dark glasses in the car and she could easily go back and get them. After I finished the swim she figured she'd drive back to the motel, get a bite to eat, and then drive the 20 miles to Windsor to meet me at the finish. I was aiming for a 3 hour bike ride (and faster, if I could), so it seemed like she'd have plenty of time, but things were much tighter than she thought. First, there was a horrible traffic jam getting out of Guerneville, and when she finally got to Windsor, there was no parking at the high school and she had to park relatively far away where a shuttle bus took race spectators to and from the high school. She got there in time to see me finish but with a lot less margin than she'd thought. Since we started so late, we were there when the fastest of the ironman-distance swimmers finished and his time was 46 minutes, which seemed spectacular to me. That's better than most of the professionals at the world championships in Kona. So I became convinced that the swim course was short. It's funny that it would be short, though, since it's along an almost-straight river where distances would be particularly easy to measure, and the turn-around buoys were at exactly the same place that they have been for years. In addition to talking to friends from SVTC, I also met a guy named Joe Pritchard, and when he said his name, another guy said, "Oh, you're really, really good!" Luckily for me, Joe was 5 years older than I am, so I didn't have to worry about him. That turned out to be a very good thing, too! He's a very nice guy and we swapped a bunch of stories and wished each other good luck. As Matt, Dale and I walked to the river start, we joked that it was a bummer to start after 700 other people had started, since probably 99% of those people had peed in their wetsuits. But then we realized that by now the pee was all washed downstream and we'd only have to swim in the pee of the other aqua bikers. One funny thing occurred in the final seconds before the start (it was a water start, so we were all lined up under a flag-covered rope) when the starter was counting down from about 10 seconds and we, of course were edging forward in anticipation. The starter said, "Keep behind the rope!" and somebody yelled back, "It's due to the current!" Of course the current was dragging us in the opposite direction since the race starts going upstream. Matt and Dale and I warmed up together a bit in the river. The water was pretty green, and we began to realize that keeping together might not be so easy. Almost every guy in the start was dressed identically: a black wetsuit, an orange swim cap, and (somewhat fogged) goggles. At the starting gun I tried to stay with Matt, but lost him almost instantly and afterwards he told me he'd had the same problem. I never saw Dale. Besides, my goggles went from partially-fogged to totally-fogged within a minute so I just blundered along for a couple of hundred yards keeping the big reddish blobs (the course buoys) on my left and ignoring the little orange blobs (swim caps). I finally just stopped for 2 seconds, cleared my goggles, and they stayed very clear for the rest of the race, but by then I had given up any hope of finding Matt and/or Dale. The swim felt pretty solid, but the water in places was so shallow that my hand would hit the bottom, so I had to alter my stroke to pull closer to my chest than usual. It wasn't bad, though, and I'm sure everybody else had the same problem. The shallowest part of the course was right at the turnaround and I saw something pretty strange. A guy a couple of strokes ahead of me stood up (the water was perhaps 20 inches deep), took a couple of steps, and then dove in and started doing butterfly back toward the start. He was, of course, showing off, but I was damned if I was going to let somebody get ahead of me doing butterfly, so it gave me a surge of energy and I easily passed him and stayed ahead. If he hadn't done that, I might not have gone so fast. What's funny is that Matt must have been at almost exactly the same place I was, since he saw the whole butterfly thing, too. Coming back, I realized why the leading swimmer's time was so good: coming back we were on the other side of the river with a deeper channel and the water was flowing downstream much faster on that side than on the side going upstream. I didn't have any way to time my splits, but Matt noticed that it took him about 15 minutes on the upstream part and 13 coming back. I'm sure my ratio was about the same, and it really felt like I was flying on the return trip. My time was 29:44, which is the first time I've ever finished that distance in less than a half hour. Toward the end of the swim I started passing the slowest swimmers from the full aqua bike who had started long before I had, but who had to swim two complete laps. I saw at least two different colors of caps, so I caught people in at least two of the waves. When I came out of the water I started taking off my wet suit, but there were a bunch of "strippers" available who volunteered to help. At Ironman Canada a couple of years ago, the strippers were amazingly good, and they got my suit off much faster than I could have myself, so I let these guys try. Somehow, they got the rubber folded on itself on the arms and I may actually have lost a few seconds overall, but once the arms were finally off, the rest of the suit came off quickly. I may not have put on enough lubrication when I put on the suit. I'll use plenty next time. The transition area was all sandy and rocky, and I wasted 30 seconds or so trying to get some of the sand off before I put on socks and bike shoes. I shouldn't have bothered: there was a ton of sand in my socks at the end of the race, and I didn't notice it at all during the ride. Although my transition time wasn't too good (3:23), it was only 2 seconds slower than that of the fastest guy in my age group, but I'm sure I could have done better by at least a minute. I got a good start on the bike. The road away from the river's beach is too steep for some riders who walked their bikes up, but I had no problems and probably passed six people in that first 50-yard segment. Once I got on the main highway, I just spun the pedals without trying to go too fast for the first 10 minutes or so. I never even got out of the small chainring during that time, but after about 5 minutes I had something to drink and a small gulp of Perpetuem. My food strategy wasn't too critical, since it wasn't a long race, but what I did was to load one bottle with pure water and another with very very concentrated Hammer Perpetuem (a mixture of carbs:protein of 4:1). My plan was that I'd take a sip of that followed by a gulp of water so that the stuff getting to my stomach was at the correct concentration. Since I figured I'd be only on the bike for 3 hours or so, that would be plenty of food. After about 10 minutes, I was "warmed up" and started pushing hard. What made things really nice was that there were so many people doing the longer races that I started to pass people right from the get-go. There was always a "rabbit" in the distance to catch for my entire race. The roads weren't in perfect condition, but they weren't too bad. On the other hand, there were a few potholes so you have to be careful. Early in the ride I was looking at a Red-tailed Hawk and nearly nailed a pothole, so for a few minutes I thought maybe I should start using a race mantra like, "No birding on the bike." The bike route is a rolling course with only two hills which are very minor climbs. I knew that one of them was called "Chalk Hill" (where the Chalk Hill winery is located, but I decided not to stop at their tasting room) and the other didn't have a name. I couldn't remember which came first and when I got to Chalk Hill, I figured the other one was later. But it turned out that Chalk Hill was the second hill and I hadn't even noticed going over the first one. I knew that my swim is my strength and, since this was the regional championship, that there were likely to be some strong competitors, probably strong cyclists. 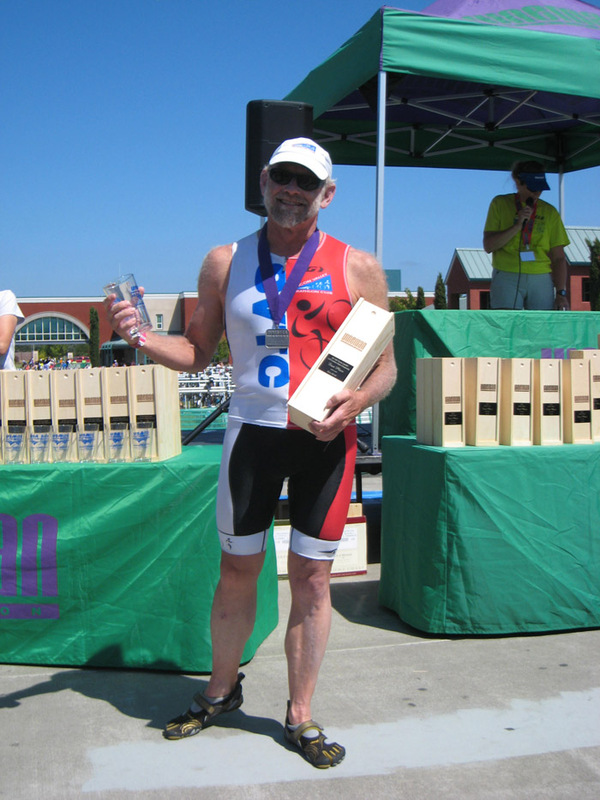 So even though I never saw anyone in my age group, I kept trying to hammer harder and harder, constantly worrying that somebody was catching me, and not knowing for sure that I'd been the first one out of the water. Again, there might have been a fast swimmer in an event like this, and for the last three triathlons I've done, there has been a guy in my age group who beat me out of the water. I was passed during the race by a fair number of people, but none of them were in my age group. (All of us have our age written on the back of our calf, so I was only competing against men in the 60-64 age group.) But one guy with a 67 passed me on the bike about halfway through the bike ride: Joe Pritchard. My hydration plan didn't work out like I'd planned, however. Recently, I replaced the aero bottle between my aero bars with a device that holds a single standard bottle with the tip forward and it worked well in my previous triathlon. But this time, at the first aid station, they handed me a water bottle with the top snapped off so I couldn't close it. It was not a standard bottle, either, so it would quickly bounce out of the cages and the only cage that would hold it was the one between the aero bars. But with the top broken off, the water just drizzled out as I rode, and so as not to get dehydrated, I just had to drink the whole thing at once, which I did. At the second aid station I picked up another water bottle and found that it was broken in exactly the same way. I have no idea why: the bottles do have a method for easy opening and closure. It was while I was cursing to myself and trying to drink the whole thing again that Joe Pritchard passed me, so I didn't say anything since I didn't see that it was Joe until he was a fair distance in front of me. I did finish that whole bottle, too, but may have to re-think my water bottle strategy for Ironman Canada. At the third and final aid station I just grabbed a Gatorade since I could see that the top wasn't broken. I drank about half of that during the rest of the race. I apparently did hydrate sufficiently, since I did have to pee at the end. Luckily, the temperature was low, so five bottles of fluid got me through the whole race. After Chalk Hill I knew that there were only about 10 miles left, so I kept pushing harder and harder, trying to go as fast as I possibly could, and I felt pretty good, but was sure happy to see the finish line. My bike leg was 2:53:00 for a total time of 3:26:07. That was good enough for first place in my division, and thankfully, Joe was in the next older category. I didn't win by much, though. The second-place guy in my age group finished in 3:27:47. I beat him by a little over 7 minutes in the swim, so he was gradually riding me down but ran out of road when he was less than two minutes behind. 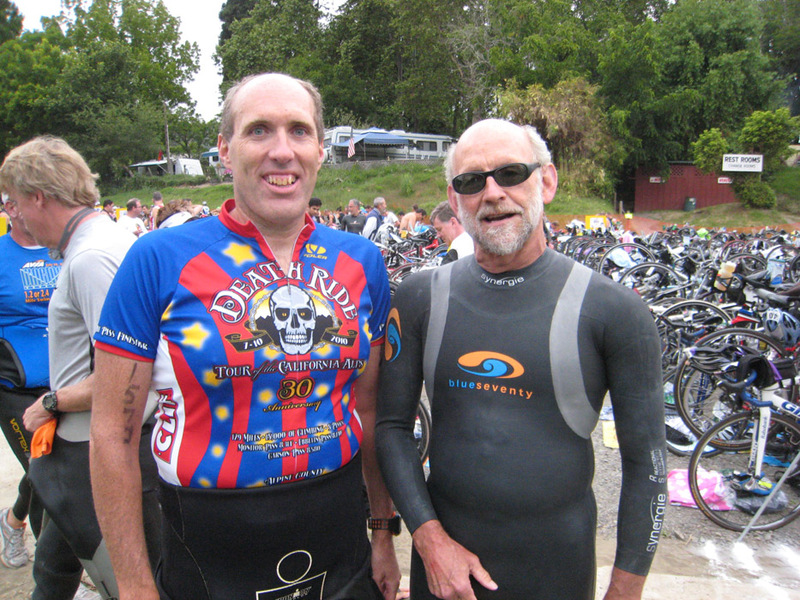 Similarly, Joe had a much better bike than swim leg, so I still could use a lot of improvement on the bike. Third place in my division was five and a half minutes behind me.